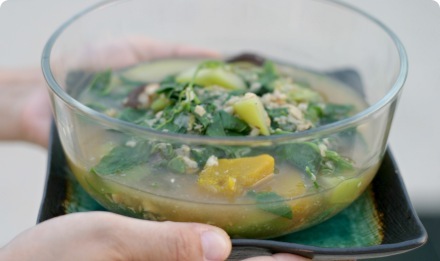 Tom Khaa is probably Thailand’s second most famous soup, after Tom Yum. It’s spicy and tangy but also very creamy due to the coconut milk. Here’s a vegetarian version made with mushrooms instead of chicken or fish. Bring water to a boil. Add galangal, lemongrass, lime leaves and knorr cube. Boil for 5 minutes or so, until flavor comes out. You will need to boil longer if your herbs are not so fresh, and you also may need to increase the amount. Add the chilies, tofu, mushrooms & coconut milk, and cook for a minute or two. Be careful not to cook for too long, just until mushrooms are finished. Turn off the heat. Add the soy sauce & lime juice, then garnish with cilantro. You don't eat the galangal, lime leaves or lemongrass, so you may want to fish them out of the soup before you serve it to your guests. Also, lime juice loses it's sourness when boiled, which is why you add it at the very end, after turning off the heat. You should serve the soup right away. Both chicken or seafood can be substituted for mushrooms, if preferred. This site is absolute beautiful and fully useful, specially the glossory. I start printing out the soup recipies. I could not find fresh galangal near me, I purchased galangal powder. Will that work? I had to add quite a bit of the galangal powder to taste. But it did come out wonderful.If I could find fresh I would buy it in a heartbeat. but this worked. Very fragrant. Tom Kah Gai is my favorite soup. this soup came out absolutely lovely. could only find frozen galangal but seemed to come out fine. thanks for the recipe! Do you have a recipe for Tom Yum?What about a good Larb? There are many Asian markets here in America now and I find Galangal easily but Lime leaves are very difficult to find.My Thai friend made tom yum with chicken broth added and we spooned it over rice. Wonderful!! If you can’t find fresh galangal where you are you can get it shipped to you from http://importfood.com/freshthaiproduce.html, however the minimum is a pound — probably enough for a few gallons of soup! However, it seems to freeze well, so that could be the answer (I’ve purchased frozen for this soup before, and it comes out nicely). Also, note that if you’re not making the veggie version you can substitute fish sauce for the soy sauce. I remember this soup from when I was in Thailand. I tried to cook it with this recipe today, but it tasted very much watered-down and with weak flavor, not creamy and with strong taste as I remember it from Thailand. Where could I have made a mistake? 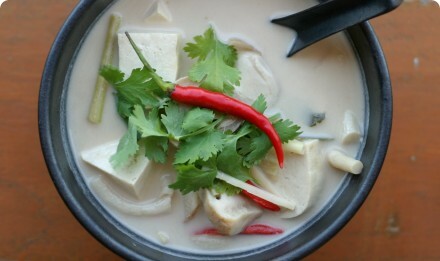 PS: I’ve seen other Tom Kha recipes which use less water and more coconut milk. Some even cook the soup in coconut milk only. Any particular reason why you use so much water and so little coconut milk?